Direct to your door - Skyline Weekender! North Coast - North State Discount RV Outlet for Weekender Trailers. There are degrees of complexity in getting away from it all. Weekender is the simple way. It matches your desire for style and mobility without the hassle. It's small enough for Saturday tailgates and large enough for long weekends. 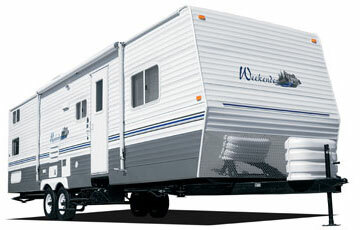 Weekender comes in just the right size and price for all your camping needs with models from 24 to 34 feet. Below are all the available floorplans. Clicking on one will take you to our printable product sheet. If it's in stock you'll find it on our inventory list. If it's not we'll be happy to custom order one for you at the same discount price percentage offered today. You simply won't find a better all round quality RV product at an entry-level price. Would recommend this make/manufacturer to other RVers? We are California’s largest single location, Skyline only outlet. We Deliver!